Another year and another batch of Commander Decks for Magic the Gathering comes along. To older players, the novelty of Wizards actually still supporting the format officially has worn off, and we’ve firmly moved into an era where these products are plentiful after the limited printing of Commander’s Arsenal and the hoarding and price gouging that marked the release of Commander 2013; sets of products that ended up being sold the next year below or at MSRP/RRP. It’s clear these are now a fixture in the release calendar and not going away, so we can and should evaluate them like we evaluate any other unlimited print-run pre-built product. This year we have five enemy coloured Commander decks to look at. There are 56 new cards spread over the 5 decks in Commander 2015. 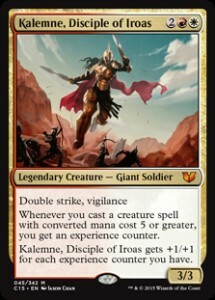 In general terms, we have two new cycles of Commanders including the new experience counter theme which is a new cycle of command style cards all ending in Confluence, a cycle of cards that tie in with the new Commanders in each deck, and a cycle of uncommon cards with the new mechanic Myriad on them. Overall, these cycles make up almost half of new cards in Commander 2015. Myriad is an interesting mechanic for multiplayer since it scales with the size of the game. This essentially allows you to attack all opponents at once and is a “may” ability which is nice since it allows you to play some politics. Don’t get confused by the formatting; you can’t throw every token at the same player because that would be a tad broken, and negate the reason it scales with number of opponents so well. 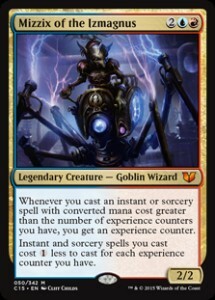 As for experience counters, they function like quest counters or any other “build x counters up, do a thing” mechanic in Magic the Gathering history. It’s novel but not strictly that new a concept. Standout cards in this cycle are the Conflunces — with Mystic Confluence making the biggest splash. I think my personal standout isScytheclaw. I love living weapons and this thing is no joke, and will wreck someone’s day if they are on a life-gain path. Dread Summons seems like it will be featured in zombie decks until the end of time, with it allowing you to put stuff in your own graveyard for reanimation and other shenanigans. Rite of the Raging Storm just has great design, and seems like a ton of fun if you run a Red deck focused on creating chaos. Thought Vessel is a new auto-include in many decks as it’s a two cost mana rock that fits in any deck and makes more combo fun possible. It’s an effect we like on a cheap, colourless, utility card that we’re used to seeing on more niche cards. Let’s take a quick look at each of this year’s decks. Full deck-lists can be found here. With its default Commander Ezuri, Claw of Progress, this functions as a +1/+1 counter deck focused on beefing up low-power creatures. It has an evolve sub-theme, which is pretty neat since I’ve always been quite fond of that mechanic. The price of this deck seems promising, but in practice there aren’t too many ways beyond things like Prime Speaker Zegana — a possible alternate Commander — to take advantage of and abuse +1/+1 counters. This is a deck that is begging for a Doubling Season type effect, or maybe just something like a Renegade Krasis. With its major focus on creatures 2/2 or below to maximise its Commander, this deck feels like it should be going more all in on the counters plan, but sans swinging big beefers at your opponent. The deck is also supposed to function as a snake themed deck. I like this idea; we need more viable themed decks in Commander, but I don’t think the critical mass of snakes is here for this to work. Again, on their own the Commanders are neat cards, but they require far different decks than they have been placed in. The deck also has a lot of incidental mana acceleration without too many ways to take advantage of it. I would advise tuning this deck to serve a particular strategy: go all in on the +1/+1 counters plan or the snake plan. As it stands, it feels like it is trying to serve too many masters and ends up serving none. This one does what it says on the tin: makes a load of spirits. At least that’s the theory. In practice this is actually a Theros inspired enchantment deck. This deck feels like it should also function as a black/white spirits deck but it doesn’t in reality. The problem being, as a black/white enchantment deck it isn’t very good. The deck is packed full of bulk enchantment creature rares that do little else but pad out the enchantment type. Celestial Archon and friends don’t have the level of power or synergy you need in this strategy. It’s just there to fit the theme. Karlov of the Ghost Council is a life-gain Commander for some reason, and in this shell he is hopelessly unviable. I feel Teysa, Orzhov Scion might have been a better choice for the alternate Commander. New Tessa is cute, but she is reliant on you getting swung at and not dying. Commander is a format of big turns, and original Tessa gives you much more utility, she’s just perfect. But this would require stripping the enchantment side of the deck out since it does not synergize with either Tessa as Commander. So with any other Commander than Daxos The Returned “Call the spirits” is a failure. Why even give us alternate Commanders for strategies this deck doesn’t contain? This feels more like a Commander deck one would actually play. Red/Blue can be a very unfair colour combination, and this is just solid rather than being broken. I think it’s actively difficult to make poor card choices in this colour combination since there is so much cool and powerful stuff out there. The premise of Mizzix of the Izmagnus is simple. Cast spells until your massive spells, or spells that scale with invested mana, cost a bunch less or can do a bunch more. With card draw you can find yourself dropping the massive spell of your choice, or surprising an opponent with a counter spell if they forget to factor in your mana discount. This deck also takes the best advantage of Thought Vessel. The alternate Commander Arjun, the Shifting Flame, could also create hilarious situations where you are drawing a new hand almost the size of your deck each turn. This deck is certainly less anemic than some of the other offerings, but again I think that’s more of a function of it being really difficult to mess up a red/blue Commander deck than any superiority of deck-building or financial value. 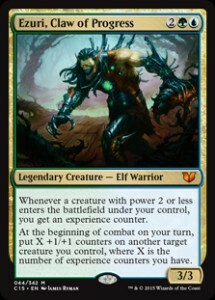 It’s also the only deck of the five that, in my mind, functions with each of its alternate Commanders. I like this deck, and it has a lot of massive cost or x cost cards that take advantage of its Commander and allows you to play with the big, fun spells that Commander was made for. Cards like Meteor Blastseem like…. well, a blast to play in this deck. Nothing like hitting everything you don’t own and all your opponents for four damage. The creature reanimation strategy in this deck is almost entirely reliant on its Commander, Meren of Clan Nel Toth’s, ability. Plunder the Graves continues the theme of not really being able to utilize its alternate Commanders that well whilst also not being laser-focused enough to maximise any single one of them. I know it seems picky to either call the decks unfocused or unable to use their other Commanders well, but that is the down side of having Commanders that try to do vastly different things in the same pre-built deck. It’s a problem with many Commander products, not just this one. Aside from that, it’s a serviceable reanimation deck. Dread Summons feels made to partner with Empty the Pits, and I wish more effects like that were here. Although we did get Spider Spawning, so Wizards did notice some synergies. When I build this type of deck I tend to go a more token based route, but straight creature reanimation is a valid direction. You have a heavy number of creatures and a lower number of creature generators, but both the alternate Commanders synergize better with token strategies. Whilst it has some sacrifice outlets, and ways to discard/mill your own cards, Plunder the Graves seem in desperate need of more ways to kill a large number of creatures at once. Gee, if only we had a black wrath spell that was in desperate need of reprinting. This is an aggro Commander deck. If you play aggro in Commander you’re doing it wrong. Everyone is going to gang up on you early in every game because they want to cast their bombs. Commanded damage is a rule made because aggro decks are generally so outclassed in the format. Okay, okay I’m only joking. Well… half joking anyway. Aggro decks aren’t always bad, and this isn’t a traditional aggro deck. It focuses instead on high drops. In Red and White you better draw that Basalt Monolith or Worn Powerstone. This deck has acceleration, but it’s doesn’t have enough reliable acceleration in my mind. Anya, Merciless Angel seems to imply you would want to get your opponent down early, yet the deck is full of high drops. You’re also almost entirely without card-draw in these colours, so you are going to run out of gas if you’re relying on your White control based cards. This one I really don’t get. Just buy a Gisela, Blade of Goldnight and build a more traditional Red/White burn deck. This deck is the most half-baked of the bunch. If you’re going to make a big-mana Red/White deck then you’re going to need to go all-in on your acceleration suite. Some exciting cards and re-prints exist here, but this is my least favorite of the bunch in terms of complete deck. How Good is the Commander 2015 Selection Taken as a Whole? There is the definite whiff of filler here. 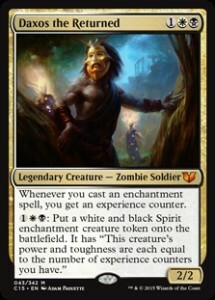 I’m not sure who runs Seal of Doom in their Commander deck even if it is an “enchantment matters” deck. A large portion of the decklists have me scratching my head since it seems to be an excuse to give us more of cards we already have and already weren’t playing. Cluestones? Guildgates? These decks feature useless cardboard you are simply going to replace with cheap, objectively better alternatives. You always expect some filler in any Magic the Gathering product, but without headline-grabbing standouts or re-prints it’s much harder to ignore the amount of filler here. Who are these decks for? If you’re an existing collector these are probably going to bypass the bulk box, and go straight in the bin. If you’re a new player, and these are supposed to be an instant Commander deck to play against your friends, then you are being given a product that requires an extensive upgrade to even come close to being competitive. These are cards you only put in your deck if you really don’t own any alternatives. Acts of desperation when you struggle to assemble basic fixing. I understand that these decks are designed to be played against each other, but the raw power level for out of the box decks this year seem significantly lower than before. If you’re going to take these into your shop as-is to play against even moderately powered-up Commander decks then you’re going to have a miserable time. There is also a cycle of re-print Commanders from Return to Ravnicablock here which is a little odd since many of these cards were already one to two dollar rares. You have the whole of Magic history to pick from, why just these recent cards? Cards like Urza’s Incubator, Phyrexian Arena, and Black Market are the kinds of cards I would love to see more of in Commander products; cards printed only once or twice a good while ago but have heavy utility in the format. Many of these cards have no hope of being re-printed in a Standard environment, so a printing in a pre-built Commander deck is one of the only chances we have to see them again. Me, and every other Magic the Gathering player, is going to keep asking you Wizards: where in Urza’s beard is our Damnation re-print? 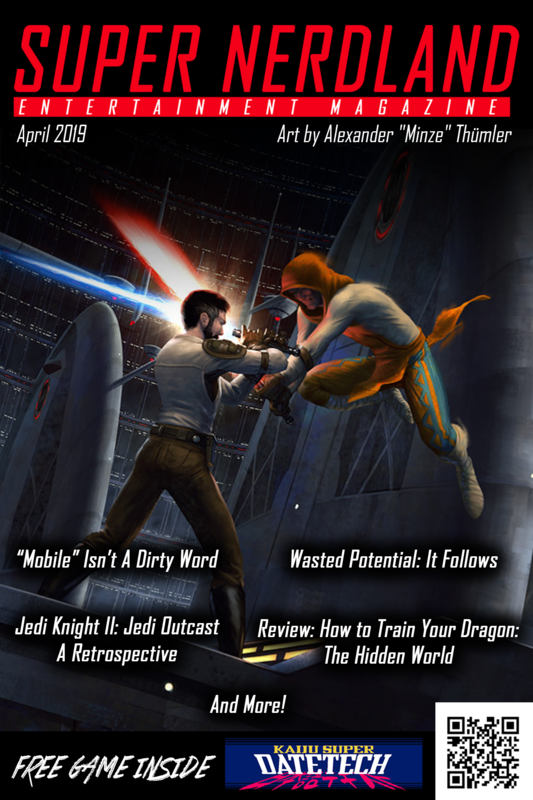 It’s a $60 board-wipe as of publication of this article and an auto-include in most non-budget Black Commander decks. 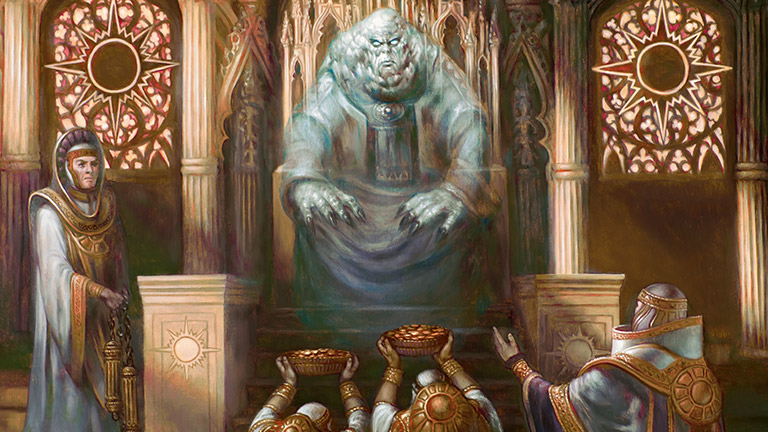 Magic the Gathering Commander 2014 proved we can have nice things and not have prices run out of control. They gave us Wurmcoil Engine again this time last year in a really cool Red artefact deck. “You get a Wurmcoil! You get a Wurmcoil! Everyone gets a Wurncoil!” When the nicest thing you can say about a set of products in “Well they’re keeping Skullclamp in print” you’ve encountered an issue. Whilst there are some interesting cards in Commander 2015, and some fun strategies, you would do better to order the singles you need for the strategy of your choice, and fit it into a better shell than these slightly stringy decks provide. The cycle of Confluences stand head and shoulders above the rest as the most interesting new cards present here. You should have a look through the catalogue of still readily available Commander 2013 and 2014 decks for one you think is a good base for the strategy you want to play, and work from there. If you are set on buying a 2015 deck then I would advise going with Seize Control for fun or maybe Plunder the Graves for some of the neat Black reprints. In terms of value Commander 2015 is comparable, but a little lower, than previous years if you look at TCG player prices. No one deck stands out in my mind in terms of raw value. They are still better value than an intro pack, don’t get me wrong, but they don’t contain value equal to or above their ticket price like some of the recent event decks or Clash Packs did on release. Look at these for their play value, not their financial value. Because on that front I’m not entirely convinced with these decks. Like has happened with the 2013 and 2014 products, expect to find these in six months to a year being sold below their MSRP/RRP. The Commander 2015 decks still serve as a viable and easy way for new players to get the basics for Commander, but they are far from optimal. Last year’s Planeswalker Commanders and their surrounding decks were a lot more interesting, and had a lot more solid cards in my opinion. Whilst the two new cycles of Commanders add welcome new strategies designed directly for Commander format, you can pick all of them up for under $50 right now. It feels more like “here is a bunch of cool new cards to play with in Commander” rather than five well-built Commander decks in their own right. 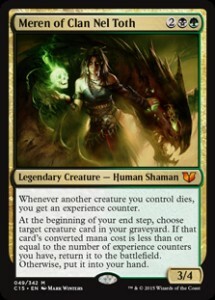 I like that Wizards of the Coast keeps making unlimited print Magic the Gathering Commander products, I really do. But please, you need to do better than throwing a pile of cards together and calling it a deck. There are dozens of budget Commander brews out there far better than these. I know they are only £25 or so, but most of what you are getting is filler. They are, in my mind, simply not worth buying this year. John Sweeney is a terribly British man with a background in engineering. 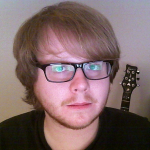 He writes long-form editorial content with analysis of gaming, games media and internet culture. He also does the occasional video game retrospective with a weekly column about Magic the Gathering thrown in for good measure. He also does most of our interviews for some reason, we have no idea why. A staunch supporter of free speech and consumer rights; skeptical of agenda driven media and suspicious of unaccoutable authority but always hopeful for change.